Windsor Marquees offers the highest standards in marquee hire in the Chepstow area, priding ourselves on personal service, care and attention to detail. We aim to make your event a perfect and successful event. We specialise in marquees and accessories hiring and our dedicated staff are here to ensure you can relax and enjoy your day, whatever the occasion within Gloucestershire and its surroundings. Famous for its Castle and historic values, the town of Chepstow lies on the England and Wales border, just a few minutes from the M4 and the old Severn Crossing. Although Chepstow now has a busy high street with well known shops, the main centre of the town still maintains its historic values, with some stunning old architecture and remains. As mentioned, when in Chepstow a trip to the castle is a must, especially to see the views and surroundings, and if you are lucky to be there on a race event, check out Chepstow Racecourse, which is also home to a bustling market every Sunday, rain, wind or shine! There are plenty of pubs, both old and new to check out and you will not be wanting for somewhere to eat either, with a good variety to cater for all tastes and desires. 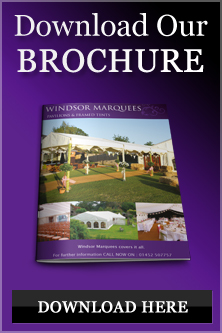 Windsor Marquees have been hiring marquees in Chepstow for around ten years, serving businesses, leisure facilities, accommodation and entertainment venues with a wide range of marquee and canopy hire.